The self-loosening of threaded fasteners can be a leading cause of catastrophic failure in industrial machinery so maintaining appropriate clamping forces is an important element in their effectiveness. HENKEL says its LOCTITE anaerobic threadlockers have proved to be an excellent method of keeping fasteners firmly in place and there is a wide range available to choose from. 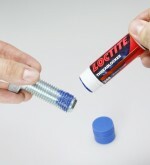 For example for applications where a liquid product may be too fluid to stay on the part or difficult to apply, LOCTITE 248 and 268 Sticks have been a popular choice. The company says the health and safety credentials of these latest generation sticks are also improved, as is their tolerance of oil, making them less sensitive to improperly cleaned parts, and these qualities have been achieved without compromising any of the products’ other key properties such as chemical resistance and shelf life.